Mullerian adenosarcoma (MA) represents 8% of all uterine sarcoma characterized by a benign, but occasionally atypical glandular component and a sarcomatous stromal component, which is usually of low grade. Mullerian adenosarcoma with sarcomatous overgrowth (MASO) is a rare variant of uterine adenosarcoma, where the pure sarcoma is similar to or of higher grade, accounts for at least one-quarter of the tumor after thorough histological sampling of hysterectomy specimen. MASO is associated with aggressive clinical course, postoperative recurrence, metastasis, and a fatal outcome. Occurrence in cervix is extremely rare, with only two cases being reported till date, which occurred in middle-aged and elderly females, clinically presented like a cervical polyp. But presence of heterologous elements in MASO is still a rarer entity, only two such cases are reported till date to the best of our knowledge. A 55-year-old multiparous lady admitted to Obstetrics and Gynecology Department with a presentation of continuous postmenopausal bleeding of 3 months duration. The per speculum examination revealed a cervical polyp of 3.5 cm diameter. But the ultrasonography and computed tomography scan in addition showed uterine prolapse with rectocele. The parametrium and other pelvic organs, iliac and pelvic nodes, status were normal. The patient underwent a total abdominal hysterectomy with bilateral salpingo-oophorectomy and was sent for histopathological examination. Gross shows a polypoidal growth arising from the cervical canal measuring 3.5 × 3 × 2.5 cm, with extensive areas of hemorrhage and necrosis on cut section [Figure 1]a. The uterus and bilateral adnexae were unremarkable. 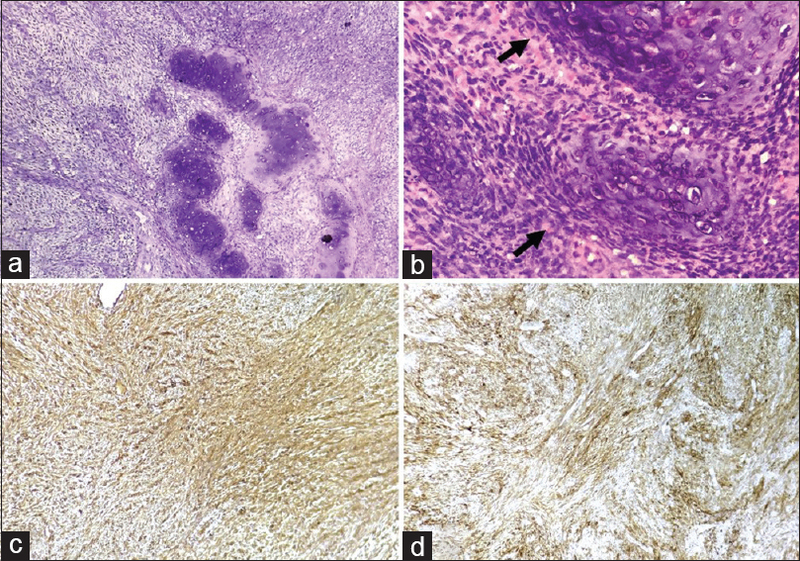 Microscopy showed benign-looking endocervical glands, some with leaf-like pattern are intervened by spindloid tumor cells showing periductal condensation of sarcomatous elements forming intraluminal stromal polypoidal projections [Figure 1]b and some cystically dilated (containing periodic acid–Schiff stain (PAS) positive mucinous material) [Figure 1]c and [Figure 1]d. The endocervical loose collagenous stroma is infiltrated by neoplastic spindle-shaped cells arranged in bundles and fascicles with intervening area of necrosis and hemorrhage [Figure 2]c. The cells exhibited small foci of low-grade sarcomatous features (M:F 3:10 HPF), whereas majority (>70%) areas showed high-grade sarcomatous component (M:F 34:10 HPF) [Figure 2]a and [Figure 2]b. In addition, admixture of heterologous component-like mature as well immature cartilage with few osseous areas were seen [Figure 3]. The uterus, ectocervix, and bilateral adnexae were unremarkable. Immunohistochemistry (IHC) was undertaken, which showed diffuse cytoplasmic vimentin and CD-10 positivity [Figure 3]c and d] and S-100 positivity in the cartilage area. But SMA, estrogen receptor, and progesterone receptor were conspicuously absent. The epithelial components were CK positive. Thus, diagnosis of MA (heterologous) with sarcomatous overgrowth was given. The patient received pelvic radiotherapy and chemotherapy (cis-platin) and is currently under follow-up for last 3 months without any significant complain. MASO belongs to the group of malignant mixed Mullerian tumor (MMMT), which are infrequent neoplasm of uterus, comprising benign glandular and malignant stromal component of homologous type (fibroblasts and smooth muscle) or heterologous type (cartilage, bone, muscle component). Most adenosarcomas evolve in uterine corpus, accounting for 8% of all uterine sarcoma, but rarely in uterine cervix (2% cases). It encompasses two categories of tumors, the first group includes highly malignant tumors with high mitotic index (10–22/10 HPF) and low survival rate. The second group includes the tumor with low mitotic index (5/10 HPF), well-differentiated features, and prolonged survival up to 18 years postoperatively. On review of the literature, only two cases of MASO arising from uterine cervix have been reported in middle-aged and elderly females, both presenting as polypoidal cervical mass (size ranging from 2 to 12 cm). On histological examination, a clear demarcation was seen in low-grade and high-grade sarcomatous areas, with pure sarcomatous area consisting more than 25% of the tumor, suggesting the diagnosis of MASO. Our study showed 70% high-grade sarcomatous component. The presence of heterologous component-like liposarcomatous area was found in one case and the other showed cartilage and rhabdomyoblasts, but both were present in adolescent (15 years) and young patient (39 years), respectively., But the present case occurred in elderly lady. 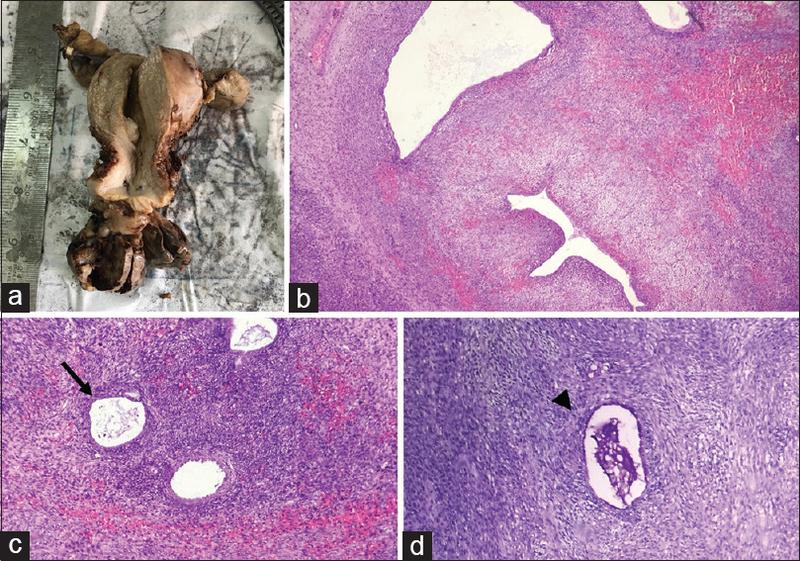 The unfavorable prognostic factors included high mitotic index, necrosis, deep myometrial invasion, lymphovascular invasion, and heterologous rhabdomyoblastic differentiation. One of the study showed metastasis to iliac and pelvic lymph nodes with spinal metastasis within 6 months of surgery in young female of MASO, who had evidence of high mitotic index, necrosis, and myometrial invasion. The present case also showed unfavorable prognostic factors such as high mitotic index and necrosis. Thus she received neoadjuvant therapy. The differential diagnosis includes MMMT and endocervical stromal sarcoma. MMMT closely mimics MASO exhibiting a spindly cellular sarcomatous appearance with high mitotic activity and is differentiated from latter by the presence of malignant glandular element. Endocervical stromal sarcoma can also present with heterologous component but is marked by absence of cystic space and proliferating benign glandular elements forming leaf-like arrangement showing papillary stromal condensation. Mullerian adenosarcoma of endometrium is less aggressive than its cervical counterpart and shows endometrial glands in histomorphology. To summarize, MASO of uterine cervix with heterologous elements is extremely rare tumor, still rarer in elderly females. This presents and mimics as a benign endocervical polyp. So thorough sampling, careful histopathological examination along with IHC panel is utmost necessary for diagnosis, and supplementation with neoadjuvant therapy is indicated in tumors having poor prognosis. Clement PB, Scully RE. Mullerian adenosarcoma of the uterus: A clinicopathologic analysis of ten cases of a distinctive type of mullerian mixed tumour. Cancer 1974;34:1138-49. 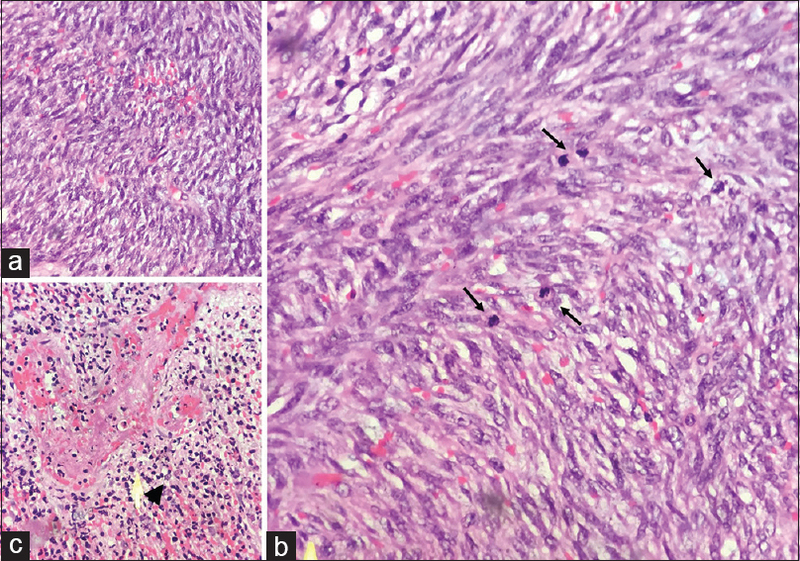 Duggal R, Nijhawan R, Aggarwal N, Sikka P. Mullerian adenosarcoma (heterologous) of the cervix with sarcomatous overgrowth: A case report with review of literature. J Gynecol Oncol 2010;2:125-8. Clement PB. Mullerian adenosarcomas of the uterus with sarcomatous over growth: A clinicopathological analysis of 10 cases. Am J Surg Pathol 1989;13:28-38. Comunoglu N, Comunoglu C, Bassallu N, Somukiran A, Calay Z. Mullerian adenosarcoma with sarcomatous overgrowth of the cervix: unusual large polypoid mass. Ups J Med Sci 2007;112:67-72. Amr SS, Sheik SM. Polypoid endocervical sarcoma with heterologous elements: Report of case and review of literature. Eur J Obstet Gynecol Reprod Biol 2000;88:103-6. Morales FD, Medina RM, Trujillo LM, Beltrán MI, Dulcey IC. Mullerian adenosarcoma of the uterine cervix with sarcomatous overgrowth: A case report of aggressive disease in a young patient. Int J Surg Case Rep 2016;27:155-61. Ramos P, Ruiz A, Carabias E, Pinero I, Garzon A, Alvarez I, et al. Mullerian adenosarcoma of the cervix with heterologous elements: Report of a case and review of the literature. Gynecol Oncol 2002;84:161-6. Mitra M, Minoo S, Soheila S. A rare case of mullerian adenosarcoma of uterus in a 14-year-old girl. GMJ 2014;3:256-9.